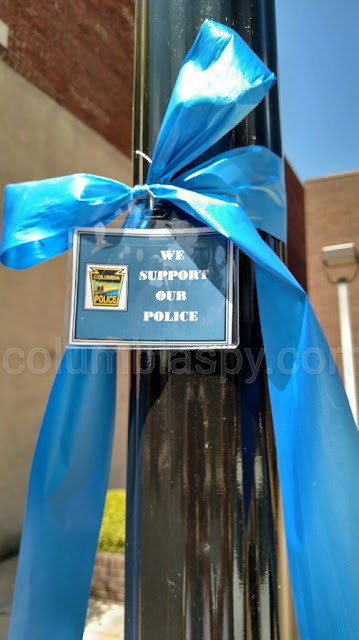 Blue ribbons have cropped up on posts on the 300 and 400 blocks of Locust. Attached are cards bearing the message, "We support our police." Yay! This is a great way to show our police that we all support them. maybe residents will do the same on their trees along the street!!!!! Thank you all police officers for keeping us safe. Thanks for all your efforts guys.. you are all appreciated more than you know. We do not say it enough !! Anyone know where to get these? Would like to put one on my porch. Let's see how many people we can get on board with this to show our support. they wouldn't be hard to make!!! you could use an index card and put it in a plastic bag and get some blue ribbon and tie a bow!!! awesome!!! maybe on of the clubs in town would do this as a fundraiser!!!! make them and sell them!! Can we just use a BLUE BOW TO Show SUPPORT? I'll start handing them out!! !